By LUDWIG VON KOOPA - Retailers to penalise the accumulation of wealth. 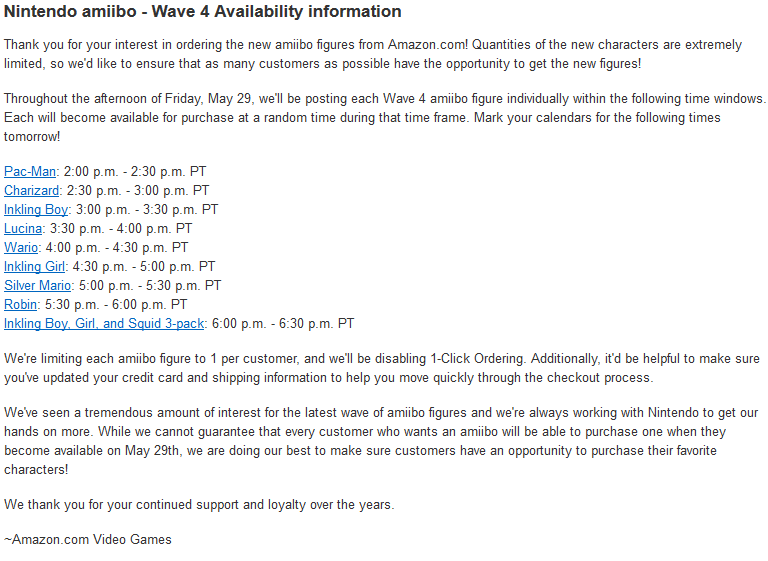 May 29: More amiibo come out. We got the three Splatoon amiibo (pictured here) plus Wave 4 of the Super Smash Bros. series amiibo. Oh, and Splatoon comes out. It's unclear which revenue stream will give Nintendo the most money tomorrow. I'll be picking up Splatoon (I pre-ordered it) at Best Buy tomorrow. Same one I keep referencing throughout KoopaTV, and the same one that I tried to get the Little Mac amiibo from, failing more than once. So for tomorrow, I want to buy the three-pack set of Inkling Boy, Inkling Girl, and Squid. That way, I can have kids and squids! I don't have that pre-ordered or any amiibo pre-ordered, yet I still want 'em. 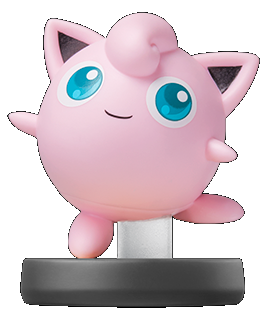 I want the Jigglypuff amiibo too but that's exclusive to Target, which I don't have access to. Apparently she's exclusive to Wal-Mart in Canada. That's much better. You can expect that May 29th's article will be gushing about Splatoon, but it'll also serve as my adventure log for the amiibo I find and stuff like that. Now then, there's a new trend that's been developed. Take it away, Amazon. "We're limiting each amiibo figure to 1 per customer". 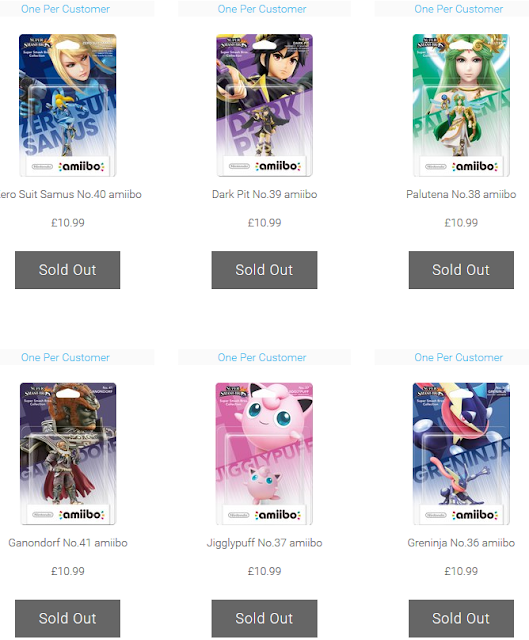 So... one per customer doesn't mean if you buy Lucina, you can't buy Inkling Girl later. It just means you can't buy two Lucina. At least, that's what it seems like. This restriction isn't limited to just Amazon. Nintendo in the United Kingdom (shouldn't Vortexica be reporting on this?) has an online store to purchase amiibo, but there is a clear one per customer rule. Doesn't make a bit of difference if they're all sold out anyway. Side note: How come the United Kingdom gets that but Nintendo of America has no such thing? Also, anyone else get a Doctor Wily Number vibe from those amiibo numbers? Speaking of the United Kingdom, there is this rumour going around (and I guess we'll quickly learn if it's true) that Nintendo is forcing retailers in the United Kingdom to restrict the amount of amiibo they can sell to every customer to one quantity of character and only two characters total. It's unclear how they plan to enforce this if a customer buys two amiibo, leaves the store, and then comes back later in the day with a top-hat on. How will they track his purchases? Match his credit card data? What if he pays with cash? Will they take photographs and pin 'em on the wall for everyone who buys something? Will they require that every customer gets a store membership card and use that when making all purchases? Those cards are scary, and that's why I don't get 'em. I don't quite like this idea of limiting amiibo purchases. If I want amiibo and am willing to pay for them, I should be allowed to buy as many as I damn please. What if I want Jigglypuff, Lucina, Robin, Wario, and all these other dudes? How do I do that if I can only buy two per store? All these restrictions do is yet again have Nintendo benefiting the dudes who live in cities with multiple game stores in close proximity compared to the rural Nintendo fan with one or two stores within many miles. If that rural fan is banned from a store for buying two amiibo, he can't go anywhere else. The city-slicker has much better options, unless the stores collude or something. But there's no evidence of that. "But Ludwig, what about the evil scalpers?" Well, rather than discriminate against customers who are willing to pay for figurines of their favourite characters, Nintendo should increase supply. Also, shortages additionally mean that amiibo are underpriced. The MSRP for amiibo should be raised. I don't know what to (that's what market research is for), but raising the price will help Nintendo's margins and reduce the inequality between supply and demand. We don't need those purchase limits! Hope they don't come to America. Ludwig will give his Best Buy adventures sometime on Friday, so stay tuned to KoopaTV for all that information. He'll look a bit squid-like, too. 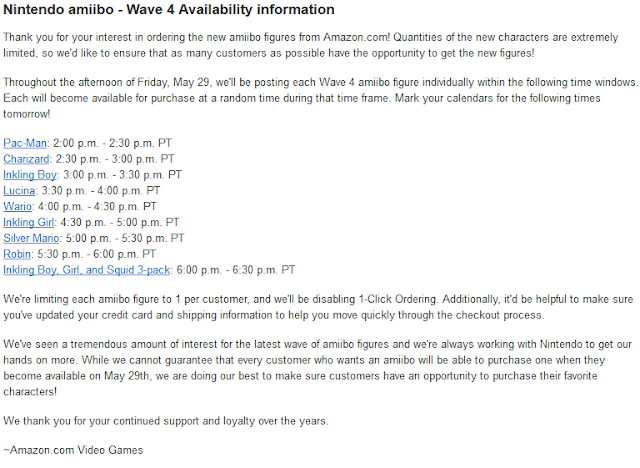 Three years later, Nintendo has raised the MSRP for some amiibo. Ludwig wants it raised for all of them. I think they're intentionally making supplies scarce now. If supply was an issue for nintendo, they could put up their own reservations a few months in advance and produce the amount needed in that time. They could also not make a 1:20 ratio of X character to mario. The staples aren't flying off the shelves,so they could balance it. Also,It seems strange that skylanders and disney infinity each get 4X the shelf space. Even if you wait in line hours early, they still don't get enough. Where I live, a target got ONE squirt gun for splatoon,and several amiibo have been like that. If things keep up,the bubble will burst and the whole thing will die out. Yeah, at Best Buy, there is about 1/3 of the Nintendo shelf to amiibo, 1/3 to Wii U/Wii games, and 1/3 to 3DS games. The opposite shelf is 1/3 Skylanders, 1/3 Disney Infinity, and 1/3 3DS demo. ...And yeah, plumber-boy now has a SILVER edition so he can take up twice the space than he could before, as seen here in my adventure today. Thanks for the thoughts, Marmar!